Myles Erlick, of Burlington, Ontario, Canada debuted as Billy in Chicago on Sunday, October 17, 2010, becoming the 6th boy to play the role in the Chicago production of the show. Myles replaced originating Billy, Tommy Batchelor. He was the fourth student of Canada’s National Ballet School (NBS) to play Billy, following in the footsteps of Liam Redhead (formerly in the Broadway production), Cesar Corrales and Marcus Pei (both formerly in the Toronto production). Myles, (D.O.B: 27-Jul-1998), first got interested in performing at three-years-old when he began attending the Stars Academy for the Performing Arts, in his hometown, a school owned and operated by his mom, Franci Nicassio, who has been his guiding light during his early years of development in the performing arts. Myles began with dance and music classes and later added vocal and drama to his studies. He began entering dance competitions at the age of four and won the titles of Mr. Mini Dance Canada in 2007 and Mr. Jr. Dance Canada in 2009. His training has also included Jazz, lyrical and Acro and especially classical ballet. Myles had prior theatrical experience on his resume as well, having performed in several local and regional musicals including Annie Jr., High School Musical, Beauty and the Beast, and Joseph and the Technicolor Dream Coat. He made his professional acting debut as a child of Avonlea in the Toronto production of Anne of Green Gables in May of 2009. Like many of the other boys who play Billy, Myles is also musically gifted and plays piano, acoustic guitar, drums, and harmonica. Myles auditioned and was accepted at the prestigious NBS for the 2009-2010 school year. While there he met fellow students there from all over the world saying, “Ballet has no language barrier, it is universal.” In December of 2009, Myles appeared in the school’s production of the Nutcracker, dancing the roles of a chef, a rich boy and a guard in the show’s ensemble. Like most of the other Billys, for Myles the audition process for BETM was long and arduous. It began in early 2009, when Myles, then age 10, attended an open audition in Toronto. He was the youngest and smallest of the 10 boys who tried out that day. Like many others after that initial tryout, Myles wouldn’t hear a word for some time from the BETM creative people. 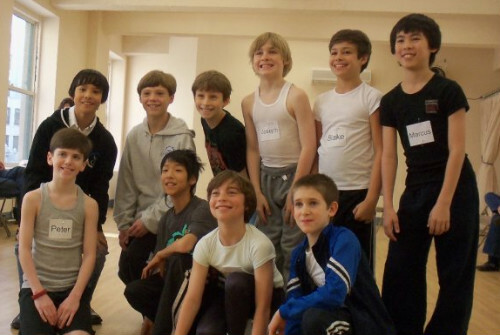 Of the ten boys in the picture (above) taken at the 5-day intensive audition in NYC in early 2010, six boys who would play Billy in one of the North American productions of the show were chosen (front row: from left – Peter Mazurowski (Broadway), Lex Ishimoto (North American Tour) and (first from right) Myles Erlick (Chicago/Toronto/Broadway). In the second row starting third from the left: Kylend Hetherington (North American Tour), Joseph Harrington (Broadway) and (first from the right) Marcus Pei(Chicago/Toronto). 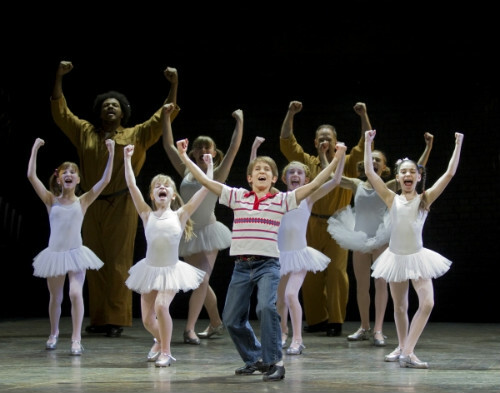 Myles says that, unlike Billy Elliot, he has always had plenty of support from his family and friends as he’s pursued his love of dance and performing. When he originally made his debut as Billy in October of 2010 in Chicago, sitting in the audience were some of those friends and family, including his mom, stepdad Ryan Marshall and older brother Tyson. And then, a new challenge as Myles moved from the closed Toronto production to arguably the biggest stage in the world — that of Broadway. Myles made his debut on the Great White Way at the matinee performance on Saturday, September 24, 2011 where he performed the role of Billy 14 more times before his last show on November 13, 2011. In all, he played his dream role of Billy 89.5 combined in Chicago, Toronto and New York. *Lyrics from the Billy Elliot the Musical song, Electricity, words by Lee Hall and music by Sir Elton John.